In Italian cuisine you often find pumpkin combined with sage and rosemary. During a holiday some years ago, I tasted some pumpkin gnocchi served with butter and basil. I really enjoyed the pairing, and as usual, when I returned home I began to experiment. The risotto that I propose is very simple, and thanks to the addition of butter and cheese, it may be the main course of dinner. The final touch of basil enhances the flavor. Cut the pumpkin into small pieces and slice the onion into thin slices. Bring a pot of water to a boil. In a pan, add the olive oil and the onion and saute until the onion becomes transparent then add the pumpkin and a ladle of water. After ten minutes the pumpkin should be soft. Pour in the rice and cook for one minute then add the bouillon granules. 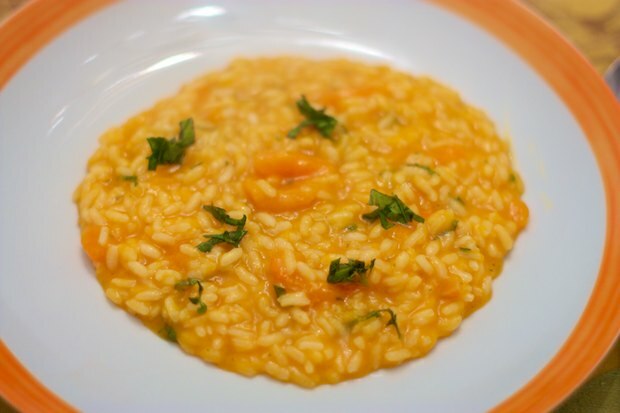 Proceed to cook the risotto, stirring frequently and adding water only when the water is well absorbed. After 20 minutes the rice is cooked. Turn off the heat and add the parmesan, butter, and chopped basil. Allow to thicken 1 minute. 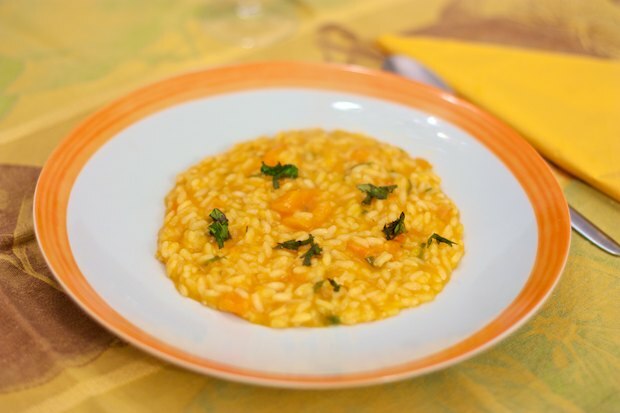 Posted in Rice and tagged with Pumpkin Risotto, Risotto Con La Zucca. RSS 2.0 feed.